In the listings below, we've included photos, hotel descriptions, transportation information, and booking links. 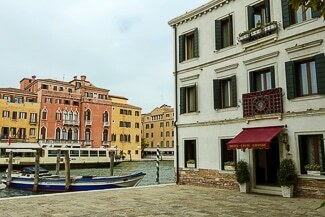 For convenience, we've listed the hotels in two subgroups, one for each side of the Grand Canal. In each group (Piazzale Roma to Rialto Bridge, Railroad Station to Rialto Bridge) we've started our numbering with "1," as you'll see on the maps. ABOVE: The numbers on this map correspond to numbers in the descriptions below. Thanks to its location alongside Piazzale Roma (at the top of the Grand Canal), the Santa Chiara is a favorite of cruise passengers and airline travelers with early flights. Airport buses, land taxis, and the People Mover to the Marittima cruise port are only a few meters from the hotel. The Santa Chiara has two wings: a 500-year deconsecrated monastery and a modern section that opened several years ago. An annex, the Residenza Parisi, provides an additional 12 rooms. Arrival and departure: Airport bus or land taxi. Nearest vaporetto stop: Piazzale Roma. Click here for walking directions from airport buses (including a video), or see Hotel Santa Chiara at Booking.com. 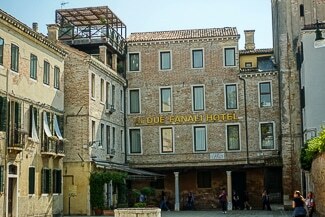 This hotel consists of two wings, shown in the photo above: a pink 14th Century structure on the left (where you'll find the lobby) and the larger yellow building on the right, which faces both the Grand Canal and a very pretty side canal. Although the hotel lacks an elevator, it does have a bar and a private garden. Click here for walking directions from Piazzale Roma (including a video), or see Hotel Canal & Walter at Booking.com. The Carlton has 145 air-conditioned rooms with an 18th Century Venetian decor. Its nicest feature may be the "Sky Lounge" bar, which offers 360-degree views of the Grand Canal and the city's skyline. A restaurant, La Cupola, is also on the rooftop. The Carlton on the Grand Canal is more accessible than many of Venice's hotels, with three elevators and three wheelchair-friendly rooms on the ground floor that have roll-in showers. Arrival and departure: Train, airport bus, or land taxi. Nearest vaporetto stop: Ferrovia (railroad station). 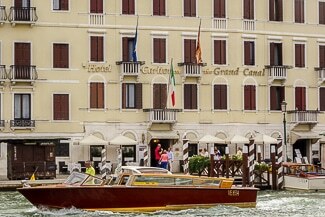 Click here for walking directions (including a video), or see Hotel Carlton on the Grand Canal at Booking.com. Next door to the hotel, alongside the church, is a pleasant little waterside square where you can have a drink at an outside table in good weather. Click here for walking directions, or see Hotel Antiche Figure at Booking.com. 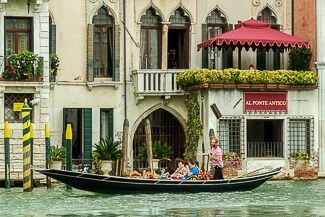 This hotel is set back from the Grand Canal. It has two gardens: a Jasmine Garden with palm trees and magnolias, and a Rose Garden alongside the Grand Canal where breakfast and drinks are served in good weather. Ca' Nigra offers a variety of well-appointed rooms and suites, some with balconies or terraces and views of the Canal Grande. Although the hotel's location on a tiny campo facing the water may seem isolated (it's certainly quiet), Ca' Nigra is less than 10 minutes from the railroad station or the Piazzale Roma on foot. We think you'll love the setting, and the walk is easy unless you have heavy luggage. Click here for walking directions, or see Ca' Nigra Lagoon Resort at Booking.com. The cozy 16-room hotel also has views from the large windows of its top-floor breakfast room, which is reached by elevator. In good weather, you can go even higher to the altana or rooftop deck (left inset photo) and eat breakfast or relax after a day of sightseeing. Arrival and departure: Train, airport bus, land taxi, or water taxi. Click here for walking directions, or see Hotel Ai Due Fanali at Booking.com. Like the Ca' Nigra Lagoon Resort and the Hotel Ai Due Fanali, the Canal Grande is on a small tree-lined square that faces the Grand Canal. The hotel, which bills itself as "the boutique hotel of the Venetian 1700s," has a selection of rooms and suites with a decor that celebrates La Serenissima's history, art, and culture. 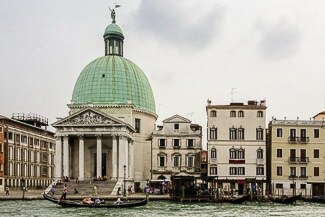 Like its neighbors, the Canal Grande is within easy walking distance of the railroad station, airport buses, taxis, and the People Mover from the Marittima cruise port and the Tronchetto parking island. 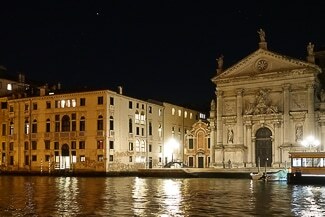 Click here for walking directions, or see Hotel Canal Grande at Booking.com. Note: There's no sign on the outside of the building, so look for the address (1302) and the brass nameplate over the doorbell. Arrival and departure: Vaporetto, train (10- to 15-minute walk), or water taxi. 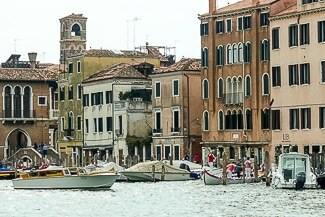 Nearest vaporetto stop: Riva di Biasio. For more photos, rates, and reviews by paying guests, see Residenza Ca' Corner at Booking.com. L'Imbarcadero's accommodations include four-bed women's dorms and four- or five-bed mixed dorms, with no bunk beds. Guests enjoy perks such as free coffee and tea throughout the day, plus access to a shared kitchen with storage space for food and drinks. 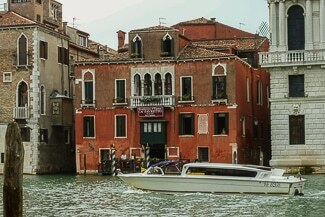 Note: Although the hostel faces the Grand Canal, its entrance is around the corner in the Calle Zen. Arrival and departure: Vaporetto, train (10- to 15-minute walk), or water taxi (very expensive). For more photos, rates, and reviews by paying guests, see L'Imbarcadero at Booking.com. Booking.com's guests rate this bed-and-breakfast as "exceptional," and who are we to argue? The location (shared with L'Imbarcadero) is wonderful, especially if you enjoy watching boat traffic during the day and the peaceful lapping waters of the Grand Canal at night. The Vista sul Canal Grande even has an elevator that will lift you and your luggage to the reception area on the third floor (or fourth floor, if you use American numbering). Note: The B&B's entrance is on the side of the building, in the Calle Zen. It's easy to find--just look for the brass nameplate and doorbell. For more photos, rates, and reviews by paying guests, see B&B Vista sul Canal Grande at Booking.com. 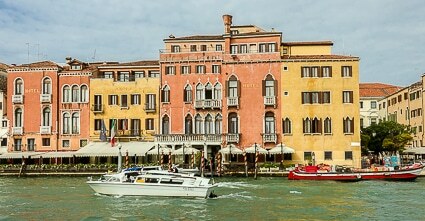 The Pelazzo Venart, which opened in 2016, is in a palazzo with a private garden on the Grand Canal, where you can arrive or depart by taxi acqueo at the hotel's water entrance. It's an intimate boutique hotel that has only 18 rooms and suites--some with terraces overlooking the city's rooftops, and others facing the Canal Grande. A Michelin-starred restaurant and bar offer indoor and outdoor dining. Arrival and departure: Alilaguna Orange Line airport boat, water taxi, or vaporetto. Nearest airport-boat and vaporetto stop: San Stae. 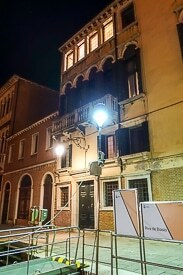 Click here for walking directions, or see Palazzo Venart Luxury Hotel at Booking.com. 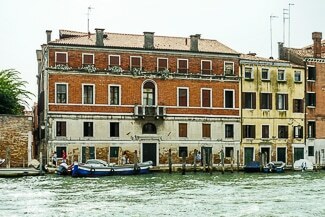 The Palazzo Giovanelli offers 41 rooms and suites, many with canal views. A café-snack bar is on the premises. 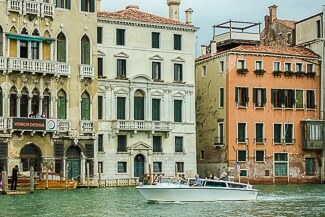 Click here for walking directions, or see Hotel Palazzo Giovannelli e Gran Canal at Booking.com. To our way of thinking, the hotel's niftiest feature is a wooden platform directly over the Grand Canal where you can enjoy the views and hear the water lapping below your feet in good weather. The hotel also has a lovely breakfast room on the Piano Nobile with a stone terrace overlooking the canal. Click here for walking directions, or see Hotel San Cassiano Ca' Favretto at Booking.com. 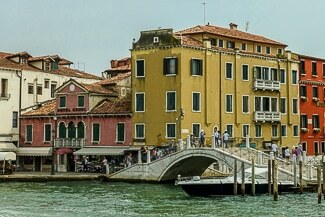 The Orologio (the tan building in the photo above) is close to the Rialto Food Markets and the Rialto Bridge. Unlike many four-star hotels in Venice, it has a sleek decor that the hotel management describes as a "contemporary minimalist style." The Hotel L'Orologio also has a remarkably wide variety of accommodations that range from double rooms to two-bedroom apartments (the latter in an annex nearby). Note: If you're using the Alilaguna Linea Arancio airport boat, be aware that you'll need to cross the steep Rialto Bridge to reach the Hotel L'Orologio. Nearest vaporetto stop: Rialto Mercato. For more photos, rates, and reviews by paying guests, see Hotel L'Orologio at Booking.com. The B&B is quite tiny--it has only three rooms--so book early if you want to stay here. Note: If you're using the Alilaguna Linea Arancio airport boat, be aware that you'll need to cross the steep Rialto Bridge to reach the Residenza Rialto. For more photos, rates, and reviews by paying guests, see Residenza Rialto at Booking.com. The Bellini isn't literally on the Grand Canal, but it faces the canal from the Rio Terà Lista di Spagna, just to the east of Venezia Santa Lucia Railroad Station. (It's the pink building in the photo above.) 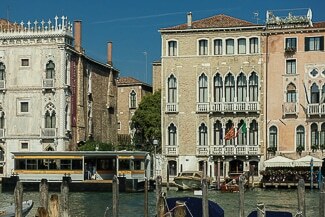 Many of its rooms overlook the Canal Grande and the Scalzi Bridge. 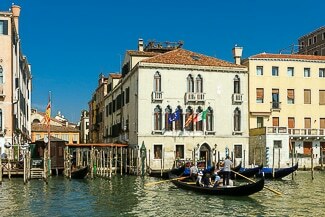 The upscale hotel has 105 rooms, all decorated in a traditional Venetian style. It also has a garden, a lounge bar, and a rooftop terrace. If you're arriving or departing by train and have heavy luggage, the Hotel Bellini is hard to beat. Click here for walking directions, or see Hotel Bellini at Booking.com. From its land entrance on the main thoroughfare from the railroad station toward the Piazza San Marco, the Hotel Principe appears to be just one of many hotels (although its hanging sign is prettier than most). From the water, it's a different story: The Principe occupies several buildings alongside the Grand Canal, with a long waterside terrace where you can eat or drink outdoors in nice weather. The Principe has 139 guest rooms (making it one of Venice's larger hotels), and some of the rooms are large enough to accommodate three guests. The best rooms have canal views, and they're well worth the extra cost. Click here for walking directions, or see Hotel Principe at Booking.com. The BW Premier Collection CHC Continental Hotel (to use its full name) is just beyond the Hotel Principe as you walk east from the train station. Like the Bellini and the Principe, it can be reached on foot without crossing any bridges. The Continental has 104 rooms and junior suites. Some face the Grand Canal or the Lista di Spagna (the street from the station), while others overlook a pretty little campo or square alongside the hotel. A restaurant and bar, including a waterside terrace, are on the premises. For more photos, rates, and reviews by paying guests, see BW Premier Collection CHC Continental Hotel at Booking.com. The Pesaro Palace, located immediately east of the Ca' d'Oro vaporetto station, is a 15th-Century palazzo in Venetian Gothic style. Its rooms and suites are decorated in a traditional motif, but they feature plenty of modern amenities, such as walk-in showers and Jacuzzis (depending on the class of room). In addition to canal views, the Pesaro Palace offers a private walled garden alongside. It's convenient not only to public transportation, but also to the shops and restaurants of Strada Nova, the main shopping street of Venice's Cannaregio district. Arrival and departure: Water taxi or vaporetto. Nearest vaporetto stop: Ca' d'Oro. For more photos, rates, and reviews by paying guests, see Pesaro Palace Hotel at Booking.com. Art is a mainstay of the Ca' Sagredo, which got worldwide attention in 2017 for a giant sculpture of two hands that reached out of the Grand Canal uring Venice's Biennale exhibition. But there's a lot more than that to the elegant 5-star luxury hotel, which is housed in a 14th Century palazzo slightly east of the Ca' d'Oro waterbus stop. Ca' Sagredo has a museum-quality decor in its public rooms (including an art collection), plus 42 opulent rooms and suites. Other amenities include two restaurants, a rooftop terrace bar, and a fitness center. Just outside the entrance is the Santa Sofia traghetto pier, where you can be rowed across the Grand Canal for a couple of euros. Gondola rides are also available. For more photos, rates, and reviews by paying guests, see Ca' Sagredo Hotel at Booking.com. 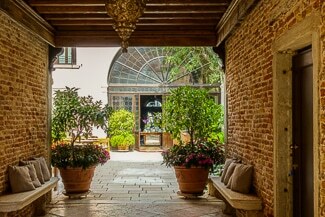 The Foscari Palace is a boutique hotel in a palazzo that dates back to 1520. Its 23 rooms and suites are decorated in a modernized Venetian style with 21st Century amenities such as hydromassage showers or bathtubs. Deluxe rooms and suites have canal views. Other services include a lobby bar, a rooftop terrace with bar, and room service. 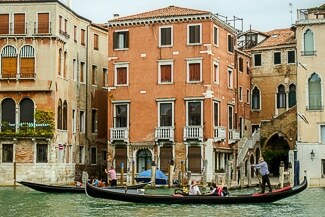 A traghetto and gondola landing is just outside the hotel entrance. For more photos, rates, and reviews by paying guests, see Foscari Palace Hotel at Booking.com. The "White Lion" is a locanda, or inn, which is comparable to an upscale guesthouse or B&B. Some of the rooms and suites have canal views, and a few are large enough for three guests. In addition to the usual buffet breakfast, the Leon Bianco has afternoon tea with drinks (hot and cold) and snacks at no charge. Note: Like many small Venetian hotels and inns, the Leon Bianco lacks an elevator, so you'll need to climb three flights of stairs to the reception area. 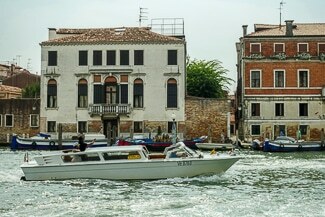 Nearest airport-boat and vaporetto stop: Rialto. For more photos, rates, and reviews by paying guests, see Leon Bianco on the Grand Canal at Booking.com. 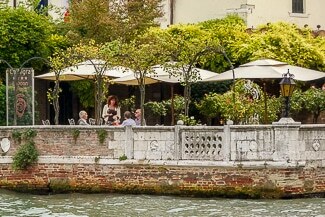 The Scalon del Doge is a family-owned guesthouse on a tiny square that looks out onto the Grand Canal. To reach it from the square, you climb an outside staircase that dates back to the 13th Century. Just open the wrought-iron gate and go up to the landing, where you'll find the entrance. The guesthouse has single, double, and triple rooms, including deluxe rooms with canal views. All are decorated in a rich Venetian style, with plenty of brocades, plaster cherubs, Murano glass chandeliers, stained-glass windows, and other features that evoke an earlier (and less aesthetically restrained) era. For more photos, rates, and reviews by paying guests, see Scalon del Doge at Booking.com. 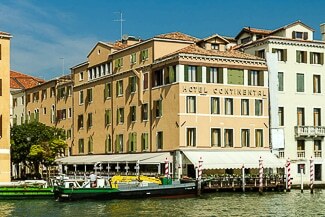 The Al Ponte Antico has a variety of rooms and suites, some overlooking the Grand Canal. A bar is on the premises, and a shaded terrace with tables faces the water, the Rialto Food Markets, and the Rialto Bridge. For more photos, rates, and reviews by paying guests, see Hotel Al Ponte Antico at Booking.com. MAP CREDIT: Basemap data is from the Comune di Venezia and Regione Veneto, using license IODL-2.0.